Standard Cover Colors: Gray, Black, White. 4" x 4", Click here for more information. Foil Stamp or Deboss: 1-color foil stamp or deboss. $55 set-up charge. For additional information, including stock and custom imprint colors, stock type styles and more click here. 4-Color Process Imprints Available! 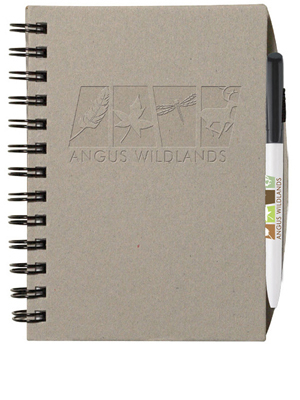 Add a vibrant 4-color process imprint to a white chipboard cover notebook. 5" x 7" Notebook Imprint Area: 3 1/2" x 6".